How long do potato plants live? I know the plants are dead when I used to harvest. I have to keep the grafted plant alive for 4 or 5 months at least to give the tomatoes a chance. if that works I may try the reverse graft- potato onto tomato rootstock. The potato then puts all it's energy into making blossoms/seeds. After 7 days in the dark there was no evidence of droop,so I put it under the lights. No soil,I am forcing it to live off the potato until it is used up. Still bagged until I see signs of growth. day 16 in pomar's life. cross between omar's lebanese and purple majesty. I slit the heat shrink tubing today for the "gillian cooke" effect. Here's a small update on the process.Well,to my amazement,the chinese lantern physalis alkekengi fused with the potato rootstock and is growing...vigorously. But out of 10 plants only 1 took,errr...that might be due to me not sterilizing the razor and box they were healing in.I will graft more soon,this time I'll be more hygenic. 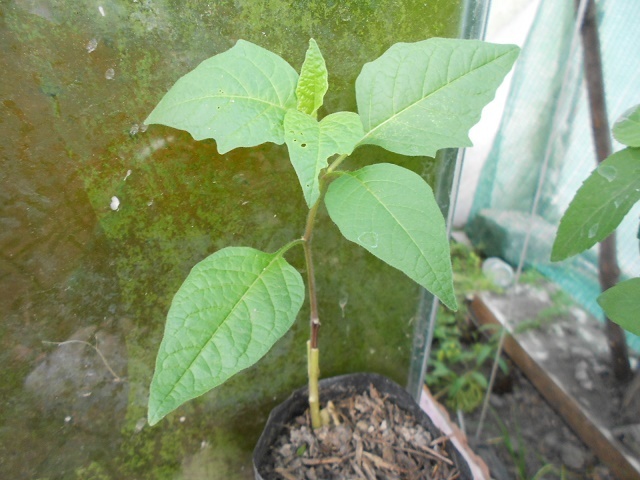 The solanum dulcamara seedlings are growing but still too thin for grafting.Once they are grafted I'll post update on that as well. I have high hopes for these 2 species,because they are a) native in my area b)they are weeds.The chinese lantern has been such a nuisance ever since I found it growing in the nearby woods and planted it home.Solanum dulcamara is weedy and tough as well,establish plants seem to resist anything thrown at them and can also grow in shade. mine is still the same size and the leaves are starting to turn yellow with brown spots. Grafted a couple of plants.The scion this time is S.Dulcamara a common weed.Most of the garfts took,will report further results. physalis alkekengi scion didn't work out.The plant was stunted in growth and eventually died. mine was a true bonsai and never grew any bigger than that.I put it outside and it died the end of june. Another graft experiment never took and that died also. Hats off to anybody that grafts,I never had any luck.